Nigel has over 20 years experience as a Chartered Accountant and is also an Independent Financial Adviser. He has represented many taxpayers successfully during Inland Revenue investigations. Nigel Holland has a BA Honours degree in Accounting and Finance and is a qualified Chartered Accountant. 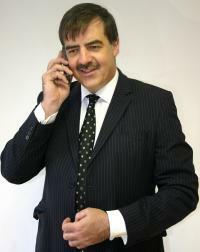 Nigel is the principal of Holland & Co Chartered Accountants which has been established for over 30 years. Nigel overseas all the work which is produced by staff, including accounts preparation, submission of tax returns for sole traders, partnerships and limited companies. Nigel specialises in new business start ups, meeting new clients of the practices and helping established businesses grow. Some people get help from a professional, for example an accountant, but you can set up a limited contract yourself. paying for their National Insurance – but you can claim an allowance to reduce your bill. We have managed to help a client set up a business from nothing. We helped this client generate a profit which was in excess of over a million pounds for one year alone. This was achieved very soon after the business was established. The profit was generated due to the combination of hard work from our client, choosing a viable business idea, good planning and good advice from us. Not only did we help the client make a profit of one million pounds in a year but we also managed to ensure that the corporation tax bill was zero. We achieved a zero corporation tax bill by bringing forward tax losses from earlier years and by making various claims. Our client was extremely pleased with our service.